Advanced features include a 128-channel/128-zone capacity, 5-Tone Signalling, FleetSync 13-segment/8-character backlit LCD. Compact enough to carry anywhere with ease, this smart new radio has a distinctively ergonomic form that’s handy to hold and operate. The TK-2170/3170 provides loud, clear audio even in noisy environments. 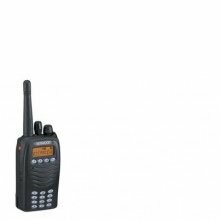 The convenient 128 channel/128 zone capability accommodates virtually any current or future capacity requirement for single or multiple site radio systems. The backlit LCD with 8-character, 13 segment aliases and icons provides an easy-to-read channel, function and FleetSync® messaging display day or night. For extra convenience, a 4-step battery status indicator notifies the user immediately of the amount of charge remaining by visual indication (icons) or tone alert. "driven rain" test. *MIL-STD/IPXX compatibility requires use of the terminal cover supplied with the SP-Mic. Kenwood’s FleetSync® digital signalling system includes PTT ID digital ANI for instant radio call identification and Emergency status for personnel safety. FleetSync® also includes status messaging, selective calling and short/long text dispatch messaging features. Emergency Calling notifies a dispatcher of personnel in distress by activation of an orange coloured emergency key. In addition to FleetSync®, the TK-2170/3170 includes 5-Tone selective calls in 6-different formats, EIA, EEA, CCIR, ZVEI, ZVEI2 and the Kenwood format. Kenwood’s TK-2170/3170 VHF/UHF portable radios provide easy operation plus versatility and reliability in a compact yet rugged package. Advanced features include a 128-channel/128-zone capacity, 5-Tone Signalling, FleetSync® and easy-to-see 13-segment/8-character backlit LCD. the user, the TK-2170/ 3170 will place an emergency call to a pre-determined person or group of people. The TK-2170/3170 supports Voting function, which is to look for and lock on to the best repeater signals automatically in the multi-sites system. This feature enables customers to make communications without compromise. The TK-2170/3170 offers a lightweight Li-Ion battery (KNB-35L), ideal for low-temperature environments; a durable Ni-Cd battery (KNB-25A); and a powerful Ni-MH battery (KNB-26N) for extra-long life. The built-in voice inversion scrambler provides basic protection against casual eavesdropping. The TK-2170/3170 offers convenient hands-free operation with a compatible headset. The TK-2170/3170 internal VOX (voice-operated transmission) circuitry provides automatic PTT and a 10-level sensitivity adjustment for different ambient noise levels. *SmarTrunk board is available from SmarTrunk Systems, Inc.